Figure 5 in the text was an inadvertent repeat of Figure 1. Figure 5 should be the following 70D detail image. I apologize to the 20 or so people who downloaded the guide before I corrected this. Please contact me if you would like the latest version. The 70D offers continuous autofocusing during Live View (and Movie) shooting, where the camera will keep adjusting the focus distance so that the subject continuously remains in focus, and thus when you press the Shutter Button half-way the camera will quickly autofocus. If you wish to take advantage of this capability for Live View shooting, keep this set for Enable (see Figure 53). The use of one of the newer Canon STM lenses will assist with continuous autofocus performance by being quieter and smoother (this is especially helpful if making use of Continuous AF for movie shooting). Note that if you make use of a continuous shooting Drive Mode during Live View to take several shots while holding down the Shutter Button, the camera will lock focus at the first shot and Continuous AF will not continue to track a moving subject. Do NOT use a cheap, ultra-thin UV filter (or cheap other filter type) on your lenses, particularly the Canon 24-70mm f/2.8L II lens, as there may be filter-to-lens contact that can damage the front lens element. See this article for more info. Canon Remote Switch RS-80N3 Canon Remote Switch RS-60E3 or Canon Wireless Remote Control RC-6: These remotes will allow you to trigger the shutter of the camera remotely, allowing either self-portraits or the ability to release the shutter without pressing the Shutter Button thus preventing possible camera shake. There is also the Timer Remote Controller TC-80N3 for time-lapse or long exposure photography. Figure 201 – During Live View, tap the Shutter Speed icon (left) on the bottom of the screen (the icon that reads “125” here), and swipe across the Aperture scale Shutter Speed scale to change the setting (right). 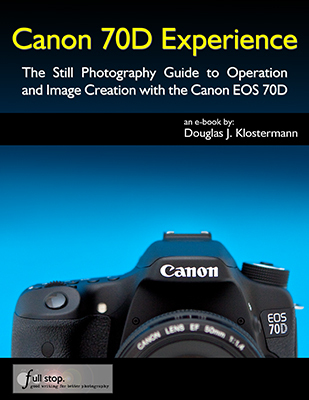 I received my 70D in December & was excited to find your book. I don’t see the HDR or even a 4th camera icon on my camera menu. Are those extra options not there any more on the latest versions? Your Mode Dial is likely on one of the Automatic shooting modes. Be sure to put the Mode Dial on Av, Tv, P, or M and then view the menus. Hello, These are all the current updates to the guide. If you would like the latest version of the book, send me an email. Hi, I just bought a 70D. I’ve previewed your book at KOBO and Kindle. Are these the latest version of your book? Just got the KOBO. Thanks for the reply. 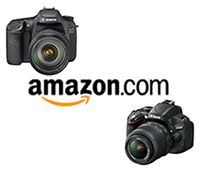 Just bought your Canon 70D Experience at Amazon. Went from a Canon FT-QL that I bought in 1968 (only 35mm SLR that could be loaded while running, and so repeatably that I could change back and forth between Pan-X and Kodacolor in the middle of a roll) to an XTi almost 10 years ago, and then to a T4i when it first came out. Got my 70D last summer. Major customization and terminology-shock, and I’m a techie. Hoping your book can decode the meanings and differences between such opaque acronyms as FEL and AF/AE Lock. I’ve just about decided that it’s not worth bothering with MicroAF adjustment when Live View AF is almost as fast as viewfinder AF – and should be immune to that problem since you’re focusing with the actual photosensitive surface. I’m a landscape and portrait photog – I might feel differently about this if I was taking pictures of sports, wildlife, or small children. Can the PDF be downloaded by those who’ve already bought the Kindle version? (Only found out about your blog by reading the Kindle book!) If I could print the Kindle book it wouldn’t matter, but that’s not allowed! Send me a receipt or something from your Amazon purchase, and I will send you the PDF version! I have purchased a copy of your book from Amazon UK and I would be grateful to receive a .pdf of your book and I thank you for your assistance which is appreciated.